Peppers, garlic, tomatoes and onion. 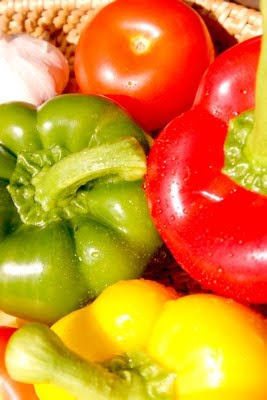 Here you are the main ingredients of the Sicilian Peperonata. It could seem a difficult to digest dish. But with this recipe nobody at home had this kind of problem. The hardest part is the preliminary one, the preparation of the peppers. It needs time and patience. Thermomix helps you saving time with its quick and controlled cooking. The Peperonata is a typical Sicilian dish; it's a stew made with peppers and onion. It's a wonderfully colourful and supremely versatile dish that works as a sauce or relish but also makes a great addition to a selection of antipasti. Here it is usually served as a side dish. Roast peppers a little bit. Then put them in a plastic bag and let stew for 15 Min. Then peel them, open them and hollow out them. Cut them into strips. Put aside. Put onion in Thermomix bowl. 3 Sec. Speed 7. Gather with the spatula and repeat. 3 Sec. Speed 7. Add olive oil. 3 Min. 100°C Speed 1. Add peppers. 10 Min. 100°C Speed Gentle Stirring Reverse. Cut tomatoes and let them release all their water then add them to the peppers with garlic and salt. 10 Min. 100°C Speed Gentle Stirring Reverse. If they are too much watery you can continue cooking. 5 Min. Temp. Varoma Gentle Stirring Reverse. Keep refrigerated and serve with basil leaves on. You may roast peppers even in the oven or on a griddle.